Shannon and Kris embark on a cross country road trip, to put back the pieces of their strained friendship. But it all falls apart when their car breaks down in Kain, Arizona. A place where you can check in anytime you want but you can never leave. Director Andy Palmer stated in my recent interview with him that Badlands of Kain was his love letter to Hitchcock and The Twilight Zone and this can be clearly seen in this movie full of suspense and mystery that keeps you guessing right to the end. Andy is a superb director and is a name every genre fan will know in the coming years. 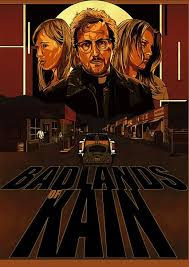 Badlands of Kain was made on a small budget, Andy and producer Warner Davis prove that when you have a good story line and great actors then money is not an issue in making a great film. Paul Soter (Super Troopers) was excellent in the role of the dark creepy preacher. People are used to seeing him in comedic roles but he fitted into this role so well. Rachelle Dimaria who played Shannon and also wrote the movie gave a fantastic performance. I love to see strong independent female protagonists. The first movie I reviewed from Andy was The Funhouse Massacre which was a fun throw back to the 80's slasher movies and this was the complete opposite being a throw back to the intense suspense thriller. This just shows Andy's versatility as a director. I can guarantee you I will have every Andy Palmer movie in my blu-ray collection. I want to see them all and so should you.